The Transfiguration, Donald Jackson in collaboration with Aidan Hart, 2002. The Saint John’s Bible, Order of Saint Benedict, Collegeville, Minnesota USA. Used by permission. All rights reserved. One of the most tragic aspects of human civilization is its emphasis on “winners” and “losers.” This stratification can be seen at all levels of society. Children learn this dichotomy between haves and have-nots through the awarding of trophies. While it is true that not every team can win, the emphasis on trophies, rather than on the fulfillment of the game, inculcates an understanding that worth is based upon attainment. The truth of our ultimate worth as beloved of God is obscured. In the Transfiguration, Jesus’ humanity is shown to be but a part of his true nature: fully human and also fully divine. The brilliance of God’s love overwhelms the earthly manifestations of the incarnation of the Son. We are not of a dual nature, like Christ. Jesus, nonetheless, dwells within us and the Holy Spirit fills our lives with the fire of God’s love. We, too, have within us the potential for transfiguration, not out of our own power, but through God’s grace. To become more Christ-like, then, is to seek the transfiguring love of God in our lives. Such seeking cannot be merely symbolic, either; it must be practical. To live in hope of transfiguration is to be purposeful about rejecting the stratification taught by the world around us. There are no trophies for the best or brightest in the kingdom; all persons receive the crown of life. Regardless of any division we could imagine, all persons are equal in God’s eyes. All persons receive God’s love in full measure. 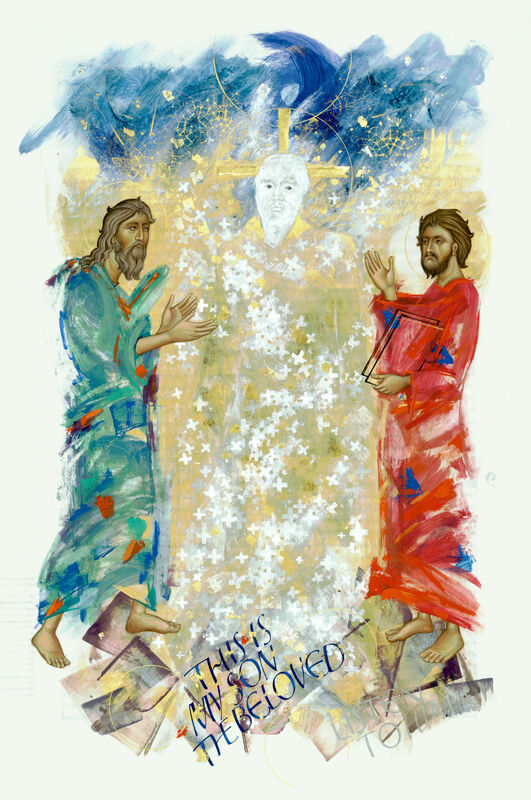 Through the sharing of the narrative of the Transfiguration, is not only Peter, James, and John who are witnesses to this miracle. We are all now part of the story. The Reverend Mark Goodman, a native of Oklahoma, is Dean of St. John’s Cathedral in Albuquerque, New Mexico. He has served congregations in Ohio, South Carolina, and New Mexico. Before ordination, Mark received degrees in botany, and still maintains an interest in that science. He is a Fellow of Sinai and Synapses, an organization whose work is the deepening of the conversation between science and faith. He is married, with two children, and he enjoys cooking, reading, travelling with his family, and taking long walks with his dog, Jeeves. This entry was posted in Lenten Reflection, Lenten Reflection 2016 by Seeing the Word Team. Bookmark the permalink.